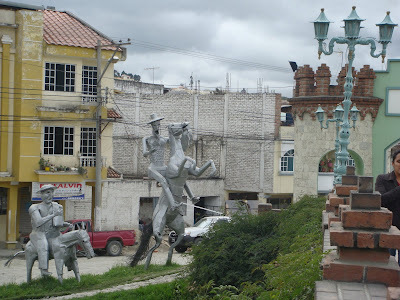 It happens sometimes that you bump in to the person you were only just thinking about, but how bizarre that I had an encounter with Quixote in Loja? Perhaps I too am tilting at windmills, and the dream of an idyll from former times is seen as little more than eccentricity. Perhaps my perception of what is real life is different now, and perhaps I prefer it that way. Of course, I am looking forward to coming home. I am looking forward to seeing my family and friends and having a long hot bath with a glass of wine and the Guardian magazine. I am looking forward to going to the theatre and having free reign in the kitchen again. My mouth waters for a pint of Guinness and some Marmite on toast (not necessarily at the same time), and I can´t wait to prance about in a selection of pretty clothes. I am looking forward to Radio 4 and Sackville Park, and I am looking forward to my books. But I will still be aiming at that distant windmill on the horizon. All those things are laid out ready for you. They have been since you set off, to be honest. Apart from the Guinness; I drank that, but I'll get you another.